Kalamazoo, MI September 30, 2015– For their second symphonic series concert, the Kalamazoo Symphony Orchestra presents Mozart and Haydn. Guest conductor, Edwin Outwater makes his KSO debut leading a diverse program of contemporary and classical highlights. The concert opens with Nico Muhly's So Far So Good. One of today’s most celebrated young composers, Nico Muhly (b. 1981) is a composer of chamber music, orchestral music, sacred music, opera, ballet, and music for collaborators across a variety of fields. So Far So Good alludes to the classical ideals of Mozart and Haydn while exploring contemporary musical language. James Austin Smith, also making his KSO debut, will play Mozart's famous Concerto for Oboe in C Major followed by Pedrollo's lesser known but charming Concertino for Oboe. Haydn's Symphony No. 102 in B-flat Major rounds out the program. Completed in 1794, this symphony contains Haydn's characteristic wit and humor along with episodes of poignant, dream-like music. At the premiere, a chandelier fell from the ceiling. Miraculously, the audience escaped unharmed because they had rushed the stage. Because of this incident, Haydn's Symphony No. 102, is often referred to as "The Miracle." In the 2014-15 season, his eighth as Music Director of the KWS, Outwater led the orchestra in a characteristically diverse array of programs. These included “The Mozart Phenomenon”; a program focusing on Stravinsky and another of works inspired by Shakespeare; and works by contemporary Canadian composers. He also continues the orchestra’s groundbreaking “Intersections” series of cross-cultural and interdisciplinary collaborations. In 2011, Outwater directed the KWS in its first commercial CD release in over a decade, From Here On Out on Analekta, with music by Nico Muhly, Radiohead’s Jonny Greenwood, and Arcade Fire’s Richard Reed Parry, the last piece a KWS commission. This past summer, in his inaugural season as Director of Summer Concerts at the SFS, Outwater directed jazz-inflected works by Bernstein, Gershwin, and Ravel; an all-Beethoven program; and collaborations with pianist Makoto Ozone and Broadway star Cheyenne Jackson, among others. A native of Santa Monica, California, Edwin Outwater attended Harvard University, graduating with a degree in English; he received his master’s degree in conducting from UC Santa Barbara. Outwater was Resident Conductor of the San Francisco Symphony from 2001-2006 where he worked closely with Michael Tilson Thomas. In 2004, his education programs at the San Francisco Symphony were given the Leonard Bernstein Award for Excellence in Educational Programming. In the United States, Outwater has also conducted the New York and Los Angeles Philharmonic Orchestras, as well as the symphony orchestras of Baltimore, Houston, Detroit, and Seattle, and the San Francisco and Cincinnati Operas. Outside the US, he has conducted the National Arts Centre Orchestra of Canada, the Toronto Symphony Orchestra, the Calgary Philharmonic Orchestra, the Tokyo Metropolitan Orchestra, the BBC National Orchestra of Wales, the New Zealand Symphony, and the Hong Kong Sinfonietta, among others. 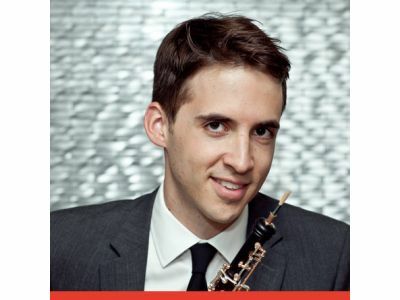 Praised for his “virtuosic,” “dazzling" and “brilliant” performances (The New York Times) and his “bold, keen sound” (The New Yorker), oboist James Austin Smith performs equal parts new and old music across the United States and around the world. Mr. Smith is an artist of the Chamber Music Society of Lincoln Center, the International Contemporary Ensemble (ICE), the Talea Ensemble, Cygnus and Decoda. He is a member of the faculties of the Manhattan School of Music and the State University of New York at Purchase and co-Artistic Director of Tertulia, a chamber music series that takes place in restaurants around New York City. Mr. Smith’s festival appearances include Marlboro, Lucerne, Chamber Music Northwest, Schleswig-Holstein, Stellenbosch, Bay Chamber Concerts, Mecklenburg-Vorpommern, OK Mozart, Schwetzingen and Spoleto USA; he has performed with the St. Lawrence, Orion and Parker string quartets and recorded for the Nonesuch, Bridge, Mode and Kairos labels. His debut solo recording "Distance" was released in early 2015 on South Africa's TwoPianists Record Label. Mr. Smith received his Master of Music degree in 2008 from the Yale School of Music and graduated in 2005 with Bachelor of Arts (Political Science) and Bachelor of Music degrees from Northwestern University. He spent a year as a Fulbright Scholar in Leipzig, Germany at the Hochschule für Musik und Theater "Felix Mendelssohn-Bartholdy” and is an alumnus of Ensemble ACJW, a collaboration of Carnegie Hall, The Juilliard School, the Weill Music Institute and the New York City Department of Education. Mr. Smith’s principal teachers are Stephen Taylor, Christian Wetzel, Humbert Lucarelli, Hansjörg Schellenberger and Ray Still. The son of musician parents and eldest of four boys, Mr. Smith was born in New York and raised in Connecticut. For more information please visit www.jamesaustinsmith.com<http://www.jamesaustinsmith.com>. For their second symphonic series concert, the Kalamazoo Symphony Orchestra presents Mozart and Haydn. Guest conductor, Edwin Outwater makes his KSO debut leading a diverse program of contemporary and classical highlights. The concert opens with Nico Muhly's So Far So Good. Next in the program is James Austin Smith, also making his KSO debut, with Mozart's famous Concerto for Oboe in C Major followed by Pedrollo's lesser known but charming Concertino for Oboe. Haydn's Symphony No. 102 in B-flat Major rounds out the program.